“Hook” design gets in and around everything. 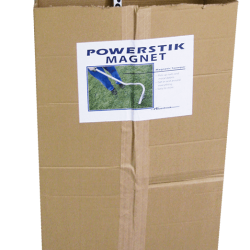 The Powerstik Magnet is a Handheld Magnet Designed to be Light and Agile. “Hook” design gets in and around everything and anything! The Powerstik was added to the Handheld line in addition to the Tundra to meet the need for a handheld magnetic sweeper with superior access capabilities. Good for detailed work around houses and areas where you can’t take a sweeper. This magnetic sweeper can reach places even the Tundra can’t due to its ultra slim profile and unique “hook” design. Because you can get so close to or right on top of the metal debris on the ground, the performance is better than its size might suggest. Easily hold over bin and clean off in seconds with one swipe of your hand. A really really good design. 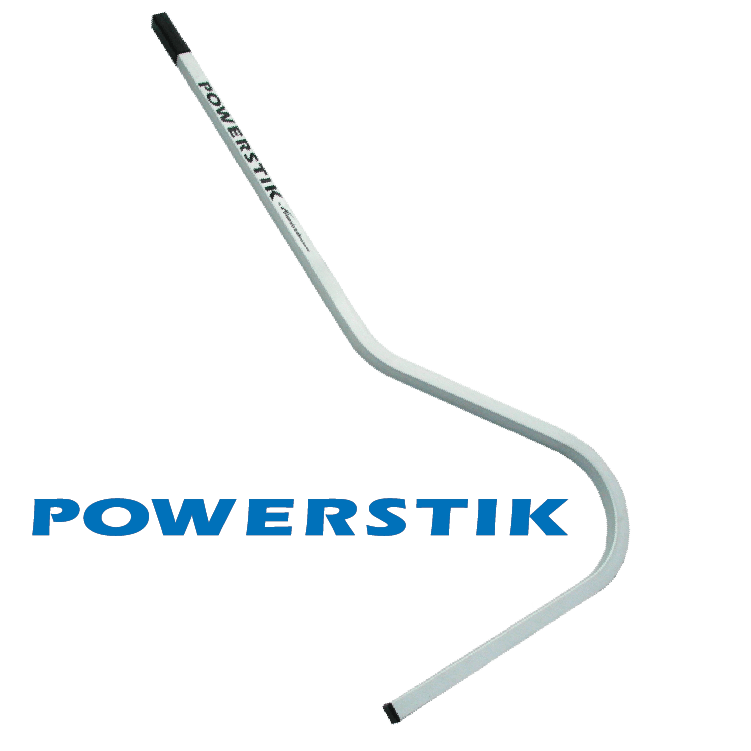 "The Powerstik is going to be able to go places that you're not going to be able to take those other "brick on a stick" handheld magnets " Good for detailed work around houses and areas where you can't take a sweeper. 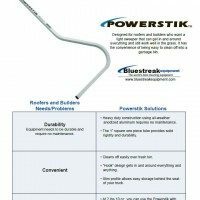 The Powerstik is extremely good for detailed work where you need to pick up metal shavings or debris around the manufacturing shop floor and in and around machines. It is ideal for roofers who need to pick up roofing nails in and around houses, flowerbeds or around air conditioning units. These areas are often hard to reach with a regular block magnetic sweeper but with the Powerstik’s ultra slim profile and hook design it’s easy. It can manoeuver around and under almost anything. Although the magnet may not be as big as other magnetic sweepers that have a larger magnet housing, the pickup performance is still good because you can get very close to or right on top of the metal debris. The performance is better than its size might suggest. Cleaning off debris from the Powerstik is easy. Hold the magnet over a bin and clean it off in seconds with one swipe of your hand. Hook design makes it easy to clean up metal shavings that are in hard to reach areas such as around and in machinery. With the hook you can manoeuver around and under almost anything. 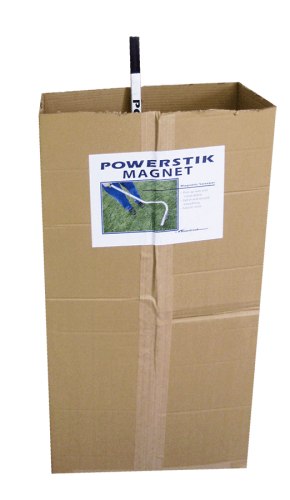 Easily remove metal debris from the magnet by wiping the debris off with your hand or glove. Although the magnet may not have a large magnetic housing, the pickup performance is still very good because you can get very close to or right on top of the metal debris. The performance is better than its size might suggest. Light weight easy to handle and lift. “Hook” design gets in and around everything easily. Anodized silver for great appearance. No replacement parts needed magnets are permanently charged. Easily hold over bin and clean off with one swipe of your hand in seconds. Just cut box top off and use box as Point of Purchase display. Box of 20 units is labelled on one side with a large 8.5″ x 11″ color label which clearly identifies the product as a magnet and its uses and benefits. Because you can get so close to or right on top of the debris, the performance is better than its size might suggest. Order a set of 20 Powerstiks in one box. Delighted with the service. Delighted with the product (and enclosed warnings and instructions). Thank you for your outstanding customer service during all the difficulties with Fedex loosing and misdelivering my Bluestreak Magnetic Sweeper, and again with Fedex damaging the Powerstick and leaving it by the road. Both magnetic sweeper are picking up roofing nails very well on the lawn, driveway and inside flower beds. Even the roofer was impressed with how well Bluestreak picks up nails. We are happy with the tool. It gets around plants great and easy. It has enough force to pick up in beds and still be easy to clean off. Ordering was great also and I will order again if the need arises. I should have ordered a couple more! The magnetic sweepers are fantastic. They are exactly what I was looking for. I should have ordered a couple more! The design is very unique. It's one of a kind.